Children simply love our Hitch Wagon. Something about riding on an old-fashioned, handcrafted wagon simply puts a smile on their faces. Choose from two different sizes for the perfect wagon to add to your space or kid's play area. Perfect for carting the children around the neighborhood, and absolutely stunning as a yard decor piece, the Amish Hitch Wagon is versatile in function. 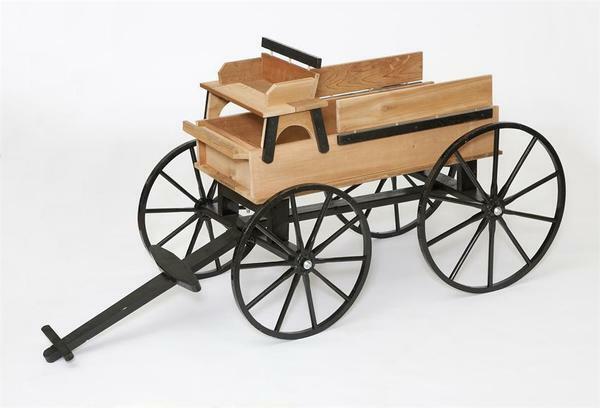 Handcrafted from Red Cedar wood, the Hitch Wagon possesses a warm and gentle allure. Our crafts are perfect for your yard, inside the home or in your business. Call us toll-free with any questions or for ordering assistance. 1-866-272-6773. Wooden Wheels: 24" & 28"
Metal Wheels: 12" & 14"
Made with beautiful western red cedar. The new bulkhead for the goat cart came in the mail today!! !..I'm anxious to get Gemma hooked up! !